Kvisoft Video Converter is an easy-to-use video conversion software for converting videos and audios among popular formats. With this video format converter, you can easily get the specific video format watched on TV, played on portable media players such as iPad, iPod, iPhone (like iPhone 5), PSP, Apple TV, 3GP mobiles, Android-powered mobile phones, etc., or put on websites, etc. Your audio & video converting becomes easy with this program. Compatible with various multimedia devices: the converted video can be played on iPad, iPod, iPhone (include iPhone 5), Apple TV, Samsung, LG, Blackberry, HTC, Motorola, Game Hardware (PSP, PS3, Xbox, Wii etc), Android devices, Smart phone, Windows phone, PMP or portable MP4 players as per your need. Supported audio import formats: including M4A, M4B, M4P, AA, MP3, MP2, MP4, WMA, AAC, AC3, MKA, OGG, AIF, AIFF, RA, RAM, WAV, APE, CUE, AU, FLAC. Supported video import formats: 3GP, 3G2, SF, WMB, AVI, AVM, AVS, DAT, FLV, MKV, MOV, MP4, MPEG, MPG, NSV, OGM, RM, RMVB, TP, TS, VOB, WMV, F4V, DV, M4V, AAX, M2TS, MTS, MJPG, MJPEG, MOD, MPV, NUT, DPG, H264, WEBM. Supported audio output formats: MP3, M4A, AC3, AAC, WMA, WAV, OGG, MKA, AU, AIFF, FLAC. Supported video output formats: ASF, MOV, M4V, MP4, WMV, MKV, AVI, Xvid, Divx, WEBM, DV, MPEG,VOB, RM, FLV, F4V, SWF, 3GP, 3G2, H.264/MPEG-4, TS, MKV HD Video, WMV HD Video, Audio-Video Interleaved HD Video (*.avi), Quick Time HD Video (*.mov), H.264/MPEG-4 AVC (*.mp4), MPEG2 HD Video (*.mpg), MPEG-2 TS HD Video (*.ts), ASF HD video. Support to extract audio from imported video, and save as needed audio formats. Support to convert videos to online video formats: such as Facebook, Yahoo, YouTube etc. Optimize and provide dozens of audio and video conversion plans to meet your requirements as per different players. Support to define your own conversion plan by clicks. Batch video conversion or audio conversion is allowed. Get duplications of imported videos. Allow to set papameters to adjust video and audio quality: like Bitrate, Encoder, Resolution, Frame rate etc. Allow to adjust video effect by setting brightness, contrast and saturation parameters. Support to preview before video conversion. Clip long video to parts to get your ideal video clips. Crop video to remove unwanted video area or get your ideal screen size. Insert watermark on the converted video. Allow to take snapshots for your preferred picture in video, and save as JPG or BMP format. Aotomatically check for update to ensure your video converter is upgraded to the newest version. Powerful DVD ripper that can encode DVD files to preferred audio or video files. Convert video files to iOS6 compatible files. Trial version of Kvisoft Video Converter is available in the following link. 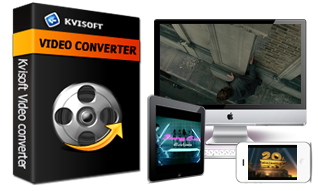 Kvisoft Video Converter costs $29.95 and can be purchased using this link. For a limited time you can get 50% discount on its purchase. Go to the purchase page and apply coupon code 45K2D46FEW or use this link to purchase.